So I had flakes all over my straw set due to the "curly jelly" I used to set my hair. I have not done a review yet on this product yet but I am sure you have an idea this is not going to be a keeper. I had to Cowash my hair the next day. I had planned to wear that straw set for a week but since that is not the case, I had no idea what to do with my hair. I started to put a French Braid on one side of my head, then I decided to put single two strand twists on the other side of my head. 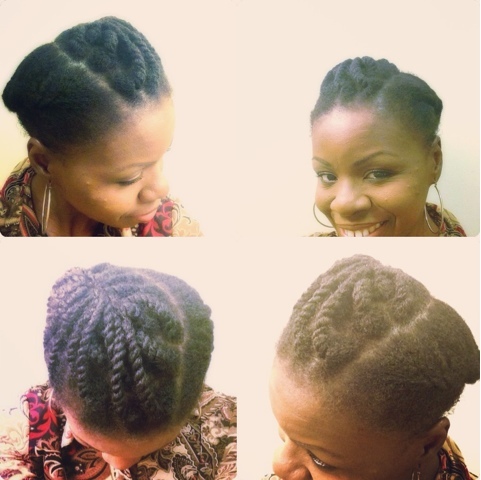 In no time, a protective style was "born" LOL!!! Tinuke you wear the cutest styles. If I wore my hair longer I would so rock them! take care. I have just discovered you and your website' as well as your YouTube channel. I must say I absolutely LOVE, LOVE, LOVE EVERYTHING you're teaching,sharing and what you're all about. You're a delight and a very beautiful brown lady with beautiful baby girls. God bless and PLEASE don't EVER relax that beautiful, God giving hair, nor your personality. This style looks so cute on you! You did great job, especially as it was last minute. I'm sorry to hear you had flaking issues. It's so tricky to find a gel that gives hold and dries clear. Have you considered aloe vera? Thanks Kay....I am trying:) you know what ? I did not even think about Aloe Vera.